An alcoholic doctor (Takashi Shimura) in post-WWII Japan tries to convince a TB-ridden gangster (Toshiro Mifune) to mend his ways and get well. While famed Japanese director Akira Kurosawa is best known for his highly influential historical films — including The Seven Samurai (1954), The Hidden Fortress (1958), Yojimbo (1961), and Ran (1985), to name just a few — he helmed a number of powerful “real time” films early in his lengthy career, many of which remain worthy viewing as well. Drunken Angel — the earliest Kurosawa film listed in Peary’s book — is notable as the movie in which Kurosawa self-reportedly “found himself” as a director. It’s also notable as the first film in which he cast Toshiro Mifune, who would become inextricably linked with Kurosawa’s oeuvre until their final collaboration together in 1965’s Red Beard; Mifune’s volatile performance here makes his star power eminently clear. Drunken Angel is an atmospheric, neo-realist rendering of life in post-WWII Japan, with Shimura’s desperate attempt to save the life of his TB-riddled patient symbolizing the nation’s struggle to right itself after years of debilitating warfare. 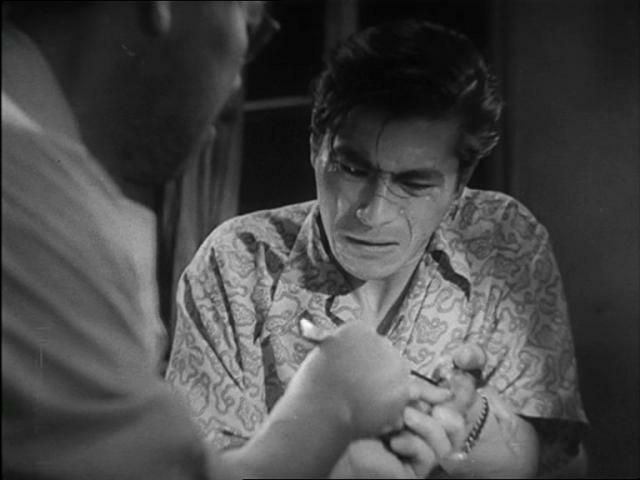 Shimura, while noble in his desires, is ultimately a flawed protagonist — he drinks too much, and is too willing to take unnecessary risks in order to rescue Mifune from himself; meanwhile, Mifune — despite his Yakuza associations — is surprisingly sympathetic, and comes across as imminently redeemable. Their relationship together is both curious and weirdly logical, and we watch with fascination to see how things will turn out for this unconventional “odd couple”. Meanwhile, Kurosawa fills the screen with sensuous yet repellent imagery, continuously evoking fetid water as a palpable metaphor for post-war decay and destruction; it’s impossible to turn away, no matter how disturbing the sight. Yes, as one of Kurosawa’s earliest triumphs. Listed as a film with Historical Importance in the back of Peary’s book. Yes, I will second that – a must. I had not seen this in years and was surprised how much it captivated me again. I’m rather in agreement with the assessment, so I’ve not much to add. Fave sequence: there are lots of memorable scenes in ‘DA’ (almost nothing seems extraneous), but what grabs me most is Shizuko Kasagi’s rendition of ‘Jungle Boogie’, which manages to spring Mifune into a rather wild dance routine. Popular at the time, Kasagi seems an unlikely type for jazz/boogie, but she sure throws herself into her styling. Though he definitely earns it, so much is made of Mifune in Kurosawa’s films that people often fail to mention Takashi Shimura – just as powerful an actor, in his own, often quieter way. I’ve never seen him be anything less than dependable (even in ‘Godzilla’!) and, when given the chance (i.e., in ‘Ikiru’ – and here, for example, where he almost takes the film away from Mifune completely but is too generous to do that), he showed he was just as capable as Mifune in anchoring a film. The final showdown in this film is cleverly done, right up to its final crane shot. NOTE: The Criterion DVD has a terrific extra which details how ‘Drunken Angel’ worked its way around the firm, American censorship board which dictated guidelines for Japanese films during post-war Occupation.